We recently got this question in our inbox from Sergio. He writes, “Hi TPU, First of all, great job you guys do with this site. It’s addictive. So, I’d like to know what you can tell us about the so much promised Brazilian Pavillion at EPCOT. Regards, Sergio” First of all, Sergio, thanks for the compliment and we are glad we can be your form of theme park crack! 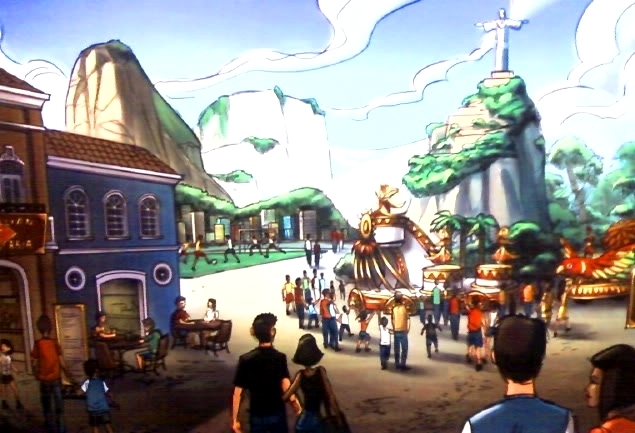 It’s important to note that Disney hasn’t promised a Brazil pavilion in World Showcase at Epcot. Despite what you may read on blogs or hear on podcasts, nothing official has come from Disney regarding this subject. The same can’t be said for other countries like Spain, Israel, and Africa. Those pavilions were indeed listed as “coming soon” at one point in time, but we are talking about over three decades ago. Those particular countries (or at least the version Imagineers were working on) are indeed dead in the water. Now, why would these countries (and a few others) actually be announced and never built? Many many reasons. For starters, the host country generally needs to agree to be represented at Epcot in the first place. This means that Imagineering has to throw out many options to the heads of state in those countries and see what sticks and what doesn’t. If you know anything about designing multi-million dollar attractions, you know that getting everyone on the same page between Imagineering, operations, vendors, and executives can be quite challenging. Now add in various heads of state and/or big-name companies who want their particular handprint on a new attraction and it can be quite challenging. This is not to say it can’t be done. It obviously has as there are eleven countries in Epcot’s World Showcase, even though we haven’t seen a new one in three decades. It’s also fair to mention that Brazilian officials did let it slip that they were talking to Disney in a 2011 newspaper article. However, that was quickly brushed under the rug by Disney as speculation. More importantly, let’s talk about what is going on in Brazil as of 2018. Things aren’t looking so good. Violence in Rio de Janeiro has gotten so bad, they have dispatched the Brazilian Army into the city. It has only made things worse. Smartphone developers have developed an app to track and follow gunfire within Rio de Janeiro. Not to mention, the number of killings by police (and to them) has dramatically increased since the start of this year. This is nothing compared to what has been going on politically in Brazil. Making American politics look like a walk in the park. There are dozens of protests going on about the upcoming Presidential election, which can be normal in some countries. However, these are often far from peaceful as riots often break out. Not to mention one of the candidates was literally stabbed at a rally a few months ago. Granted, this is what is going on in 2018. Indeed, as the saying goes, this too shall pass. However, now is not the time to be announcing any kind of partnership with Brazil. Nor is it a time to try and send tourists to what is rapidly becoming one of the highest crime rate cities in the world. Might there be talks going on? Highly doubtful at this moment in time. Could there be something in the future? Never say never. While I would personally love to visit a Brazilian steakhouse in World Showcase and have year-round access to cheesy bread, the odds of this happening anytime in the foreseeable future seem to be slim. This entry was posted in Disney and tagged Brazil, Brazil World Showcase, EPCOT, World Showcase. Bookmark the permalink. Trackbacks are closed, but you can post a comment.